By Karrar Haider in Mobile. Updated on April 9, 2018 . In today’s highly digitalized world, everyone seems to be carrying a smartphone, and that includes kids as well. If you entrust your kids with a smartphone, then you might as well use it to keep them safe too. You can add a bunch of apps in your child’s smartphone to keep them safe in both the digital world and the real world. You can monitor their phone activity, teach them safety lessons, or even track their current location to ensure they stay away from harm. In today’s post, I’ll list 5 kids safety apps that will surely be able to keep them safe from various threats. A smartphone is a big responsibility, and as parents, you would want to make sure your children don’t go astray with their devices. The leading cybersecurity company Kaspersky offers a reliable all-in-one tracking and controlling tool for your child’s smartphone. Just install the app on your child’s phone and you’ll be able to control it from a dedicated dashboard. This includes which apps and websites they can access and for how long. Once installed, the app will ask you to create a pin. This pin will be used for securing the app from unauthorized access. 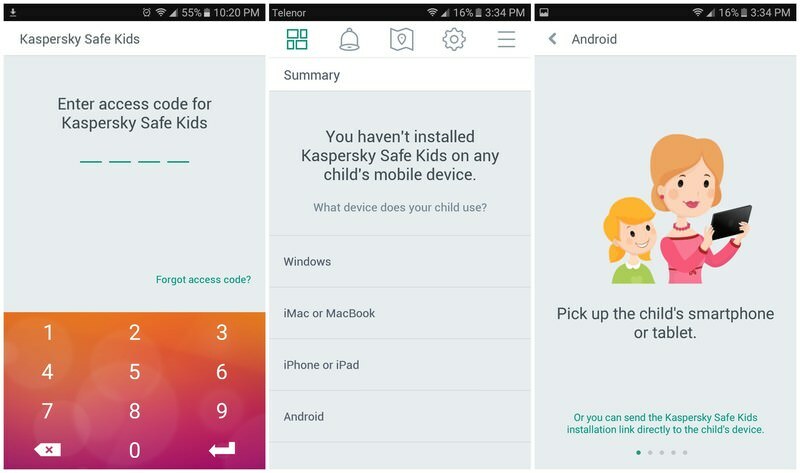 When you are inside, you can follow step-by-step instructions to install Kaspersky SafeKids on your child’s particular device. The app makes it easy for the parents to define rules and halt actions by force that go against the rules. Additionally, whenever your child tries to access anything restricted or crosses device usage limit, you’ll get a notification. 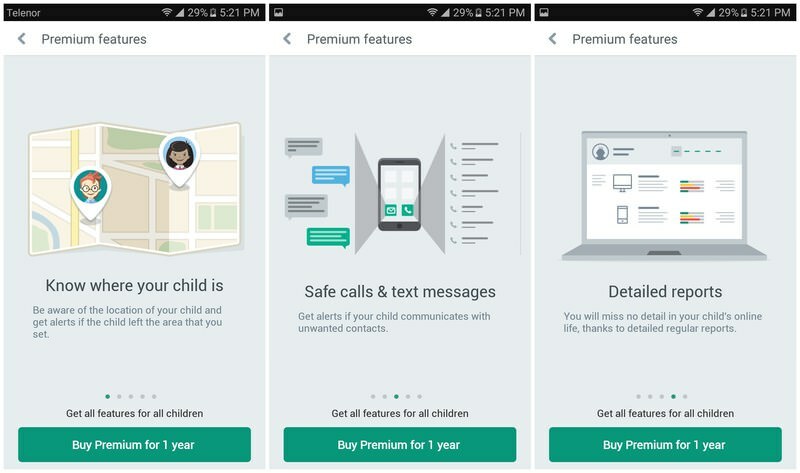 With the free version, it works as parental control app, but you can get more safety feature with a $16.99 yearly subscription. This includes child’s location tracking, call and SMS log, alerts to your email and phone, and detail reporting on app and internet usage. Irresponsible driving is a big concern for the parents of teens. No matter how much you teach your teens about driving safely, there teen instincts may kick in any time – leading to rogue driving. Not anymore though, with the help of TrueMotion you can not only track your teen’s driving habits but also motivate them to drive safely. Just install the app on your teen’s phone and it will automatically track all your teen’s driving habits and rate all their trips. You can see their current location and how they drove to reach that location. For the rating, it records over speeding, sudden breaks, phone usage during a ride, and a few other factors to give an accurate rating. After the initial signup, you’ll have to tell the app how often you drive in a week. This information is used for accurate rating, so make sure you provide the right information and so do your teens. 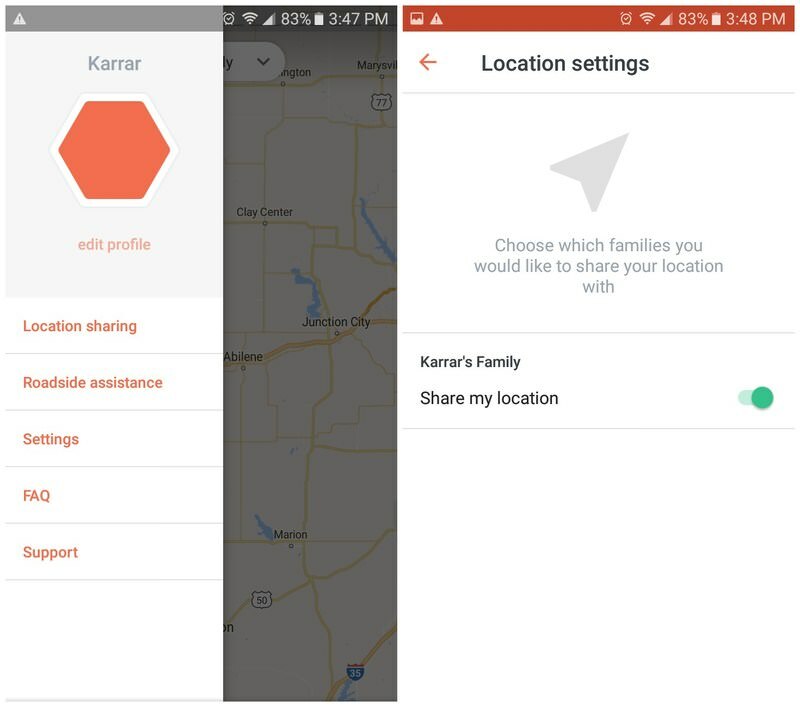 Afterwards, you can use the gray button on the bottom left corner to start adding family members to track their driving habits. 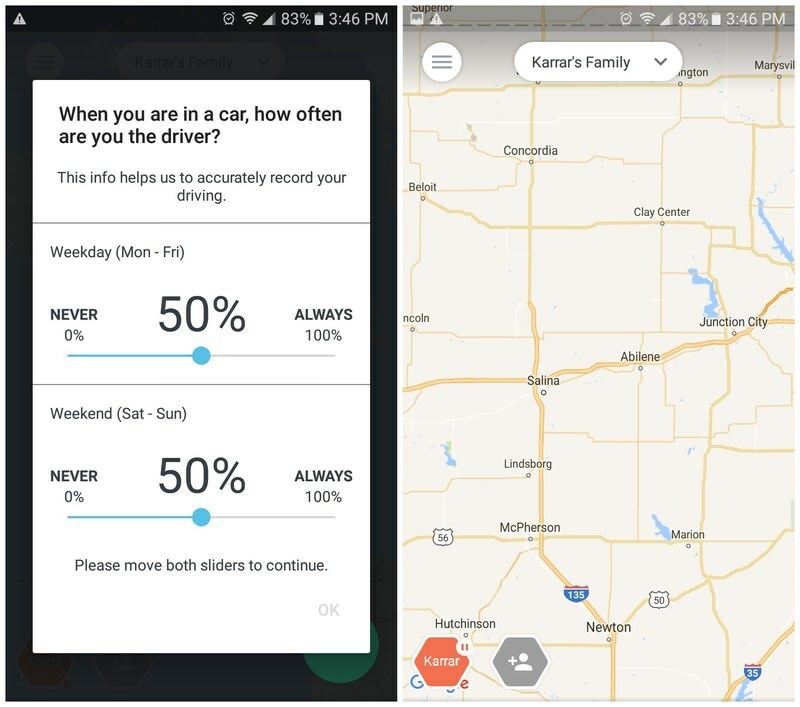 App tracks driving habits of all your family members and everyone can see the score of other members and compare. This basically creates a competition for the best score where your teen will be motivated to ride safely in order to beat other family members. To sum it up, TrueMotion offers great tracking features to ensure your family members (especially teens) are driving safely, and at the same time create a sense of competition to motivate everyone to drive safely. Being able to track your kid’s location and chat with them anytime you like is probably the best way to keep them safe. And Life360 does an amazing job of keeping your whole family connected all the time. It’s a tracking app that keeps complete record of where your kids are currently and where they were the whole day. You can also send personal messages and even talk in group chats. All the registered family members are shown on an interactive map in real-time and you can start a chat just by tapping on their profile. If you want to track multiple families or want to create separate groups for kids and adults, then there is also an option to create dedicated groups. The tracking and chatting features are completely free, but if you want some additional control and features then there is a premium version as well. 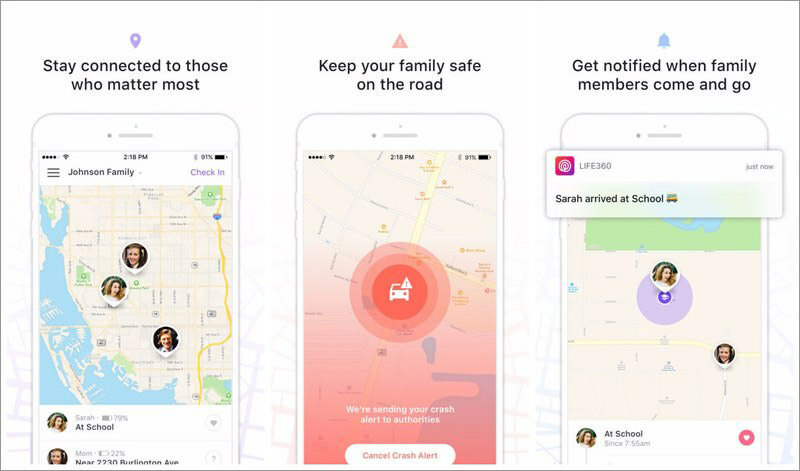 With Life360 Plus ($50/year) you can see tracking history from last 30 days, create location alerts, track a lost phone, get help in the emergency from real people, and even get roadside assistance. This is actually a game rather than an app, but it’s one of the best tools you can have to keep your kids safe. Knowledge is the key to safety, and this game provides exactly that. There are 12 chapters in the game that make your kids go through a different set of activities to learn what to do in different emergency situations. Some of the situations include escaping the fire, elevator trouble, stranger at door, getting lost, danger on the road, and more. 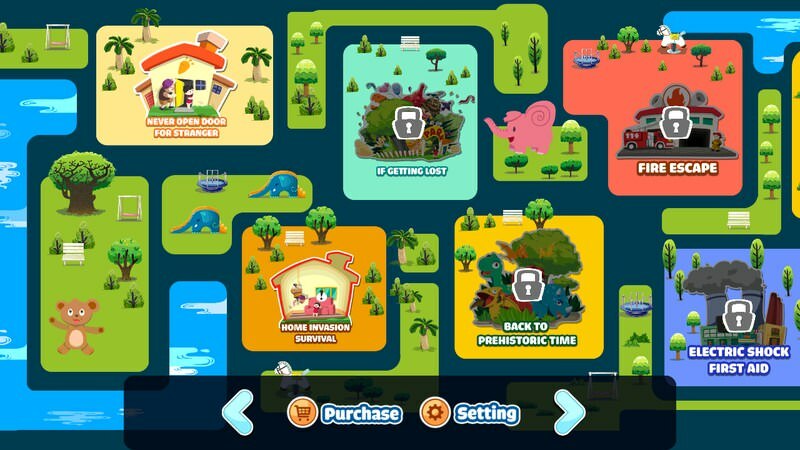 As soon as the child launches the game, they will be welcomed with an attractive map listing all the 12 chapters with matching pictures. Only 3 can be played for free, the rest can be unlocked for $1/chapter. 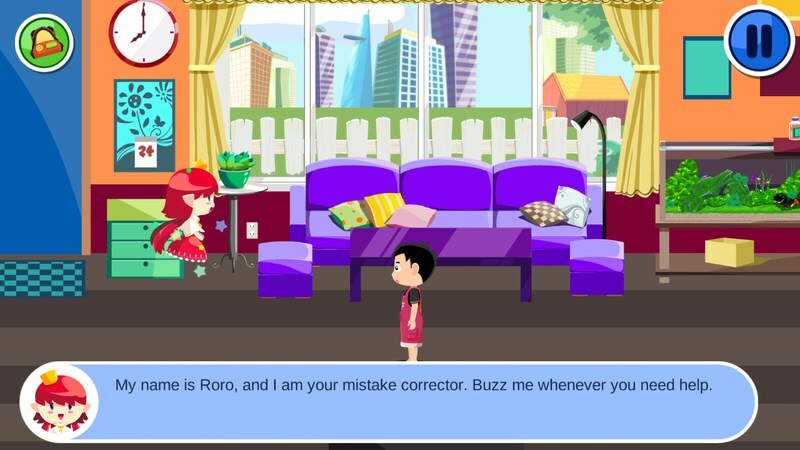 The game is voice-narrated in a very clear English and the vocabulary is also very basic. 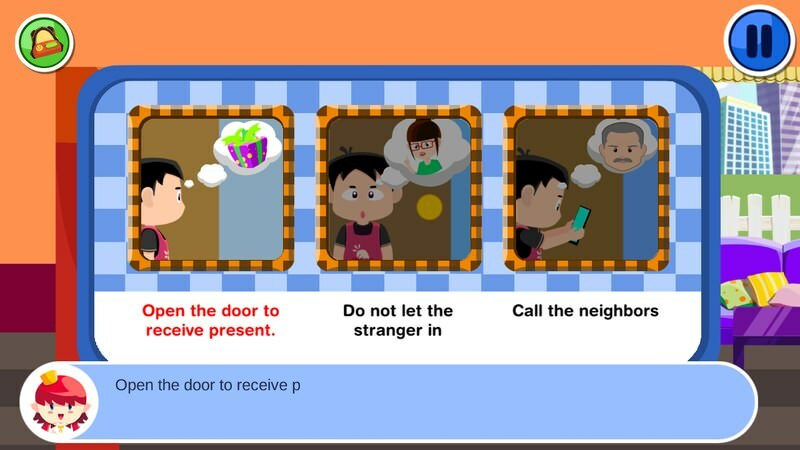 I played the first chapter “Stranger at door”, and I can assure the content is child-friendly with lots of extra tips for a better attitude. For example, the child is instructed to help with cleaning the home even though it’s not the part of the lesson. The game is also easy to play. Your child just needs to answer the right choice in a particular situation to progress further. If they choose a wrong option, they are clearly instructed why it is wrong and you should not do that. One thing I really liked is that the game usually offers 2 acceptable options in a question, but only one option is optimal. This helps the kids make a better decision as they would know why the other acceptable option is less useful in the current situation. Overall, it’s a great app to teach your children basics of safety in different emergencies while keeping them entertained. A browser is a gateway to everything on the web, and the web is filled with inappropriate content for kids. 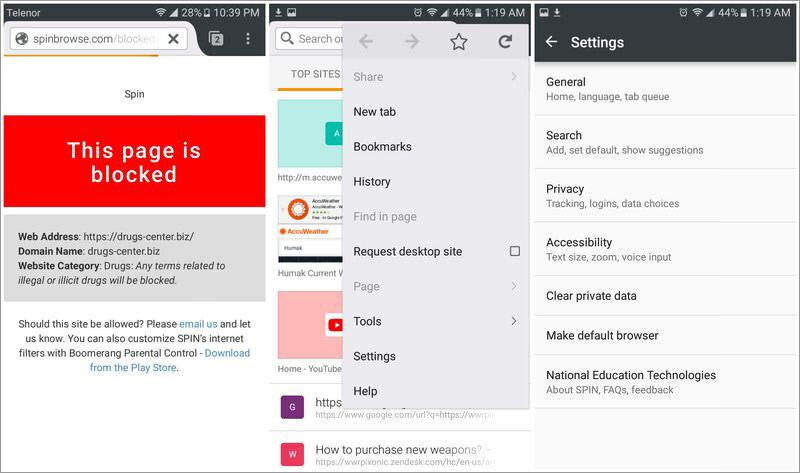 If you are worried your kids might accidentally access something inappropriate on the web, then you should get SPIN. It’s a dead simple browser that blocks all types of inappropriate content on the web without any configuration need. The filtering simply works. Just launch the browser and start exploring. If kids will try accessing any inappropriate website – either directly or through a link – it will block it. Some of the blocked content include adult content, drugs, alcohol, weapons, malware, phishing websites, proxy sites, gambling, and more. Interestingly, SPIN Safe Browser allows YouTube, but it automatically blocks channels that show inappropriate content for kids. So your kids can safely enjoy using YouTube. Best of all, it has no private browsing mode, therefore your kids can’t do any hidden surfing. 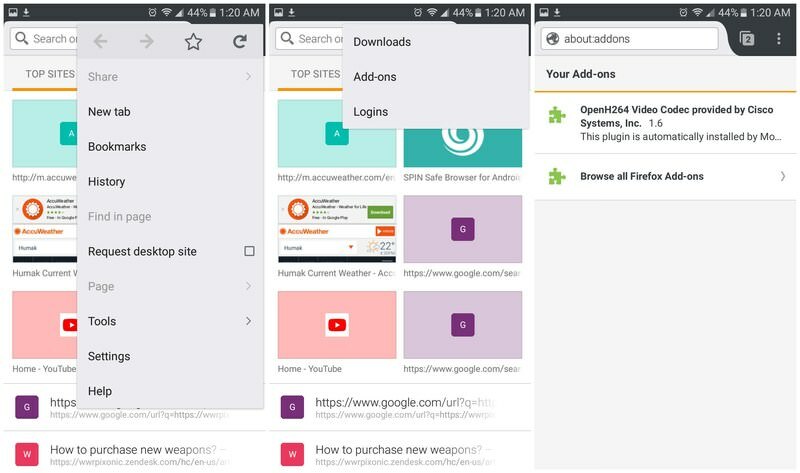 The browser is based on Firefox open source code and you’ll notice its interface a bit similar to it. You can even install Firefox add-ons by going to Settings > Tools > Add-ons. If you can track your child’s phone activity and current location, I believe it should be enough to keep them in a safe circle. Kaspersky Safe Kids and Life360 are the perfect apps to achieve this goal and they both offer the necessary features for free. Do let us know in the comments if you know any other good mobile apps to keep kids safe.